A sold-out (as it often is) Citizens Bank Park - the home of the 2008 World Series Champion Philadelphia Phillies - 11th and Pattison Avenue, South Philadelphia, by day. It opened for the 2004 season. For a better view, just click directly on the photo to enlarge it. Different game, this time at night. 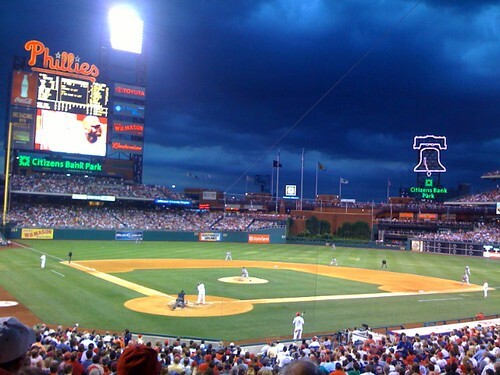 The Liberty Bell in right-center field will swing, ring, and illuminate in red, white, and blue, after a Phillies player hits a home run, and after every Phillies victory. Likewise, just click directly on it to enlarge it. These are the permanent pictures on display, on the back of the left field scoreboard (i.e., you can only see these from outside Citizens Bank Park). 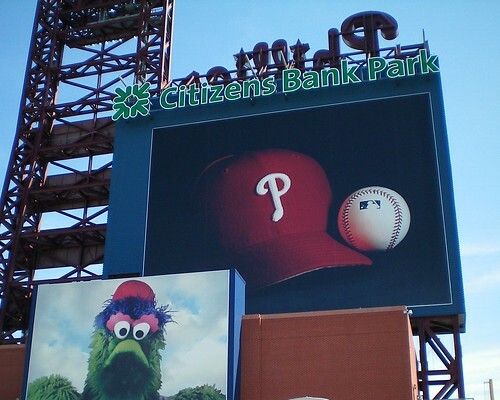 The beloved Phillie Phanatic - a Philadelphia immortal - is among the most popular of any mascots, nationally. This is the first sight fans often see at the ballpark, as they arrive for a game - and it's also often the last sight they see, as they leave afterward. For a better view, just click directly on the photo to enlarge it. The Philadelphia sports scene is among the most diverse in North America. 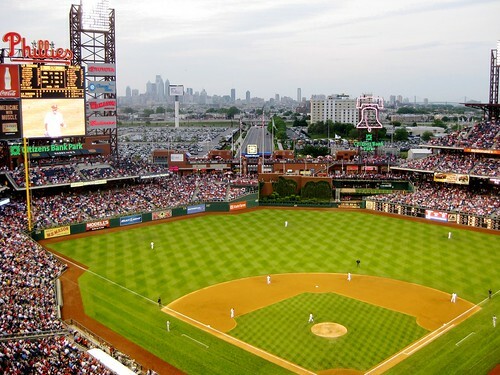 Philadelphia has the National League's Phillies in Major League Baseball (MLB), the Eagles in the National Football League (NFL), the 76ers - more commonly known as the "Sixers" - in the National Basketball Association (NBA), and the Flyers in the National Hockey League (NHL). The Philadelphia region also boasts six Division I colleges, five of which constitute the "Big Five" - Pennsylvania, La Salle, Temple, St. Joseph's, and Villanova. Drexel, although not a member, also fields a respectable basketball program. In addition, there are also major league lacrosse, soccer, and Arena Football teams (including the Soul, owned by Jon Bon Jovi). And opportunities for non-spectator sports abound as well. On the Schuylkill River, it is common to see not only crews rowing on the water, but rollerbladers and joggers, and LOVE Park in Center City, near City Hall, is a mecca for skateboarders. This page is still under construction, but there will eventually be detailed information, about the sporting scene in Philadelphia. In summary, if you're a sports fan and/or participant, you'll find no shortage of things to see and do in Philadelphia. If you'd like to leave Philadelphia Sports, and return to the home page of Enjoying Philadelphia, please click here.